THE KISAN LONG MARCH IN MAHARASHTRA - Dilli Chalo! In his essay, Ashok Dhawale, president of the AIKS, provides a brief history of farmers’ protests in Maharashtra from 2015 and explains in detail how the Long March was planned and executed. Dhawale writes that since 1991, when neo-liberal agricultural policies were adopted by the Maharashtra government (and by various governments at the Centre), 300,000 farmers have committed suicide in India. Successive state governments “betrayed assurances [given] to the peasantry” and did not meet their demands. The Long March was organised to protest these “consistent betrayals” by the central and state governments, which have become even more acute in the years of Bharatiya Janata Party rule. The preface by senior journalist P. Sainath (who is the founder editor of the People’s Archive of Rural India) discusses the agrarian crisis, “the corporate hijack of Indian agriculture” and the way forward. 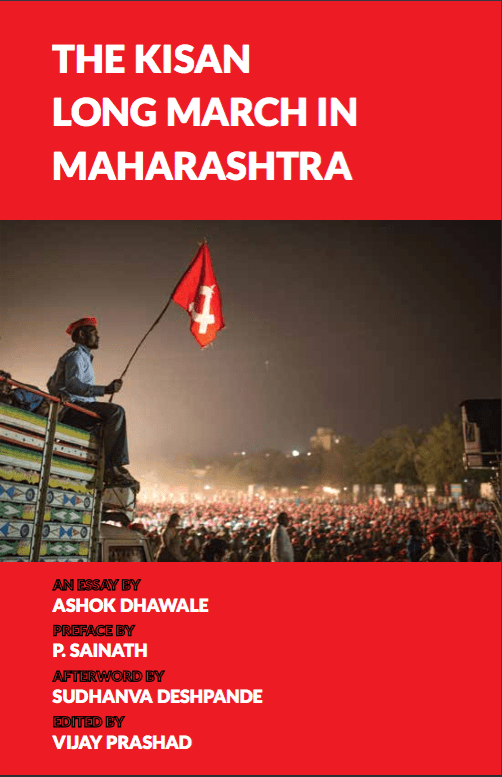 The afterword by Sudhanva Deshpande, editor, LeftWord Books, provides an eyewitness account of the Vijay [Victory] March in Kalwan, northern Maharashtra, on April 2, 2018 and profiles Kisan Sabha leaders. The text is interspersed with photographs by Shrirang Swarge (independent photojournalist), Binaifer Bharucha (photo editor at the People’s Archive of Rural India) and Sudhanva Deshpande. They record the grit and dedication of thousands of men and women, from Adivasi and other communities, who traversed long distances on foot under a blistering sun to make their voices heard by the state. More farmers have taken their own lives in Maharashtra than in any other state. According to the National Crime Records Bureau, close to 65,000 committed suicide in Maharashtra between 1995 and 2015 – more than a fifth of the total of over 300,000. 25,000 farmers and peasants, including women and Adivasis, started the historic Long March at CBS Chowk in Nashik on March 6, 2018. By the time they arrived in Mumbai’s Azad Maidan on March 12, the number had grown to around 50,000 farmers. Their demands included farm loan waivers; remunerative prices for crops; implementation of the Swaminathan Commission’s recommendations; stringent implementation of the Forest Rights Act (FRA); more pension schemes for poor peasants and agricultural workers; compensation to farmers for losses due to pest attacks; vesting tillers with the rights to temple and pasture lands; opposing acquisition of peasant land for elitist projects like the bullet train and super highways; issues with the public distribution system; and a complete change in the river-linking scheme in Nashik, Thane and Palghar districts. The largest number of farmers in the Long March came from Nashik district, followed by Thane-Palghar districts and Ahmednagar district. The farmers walked 43 kilometres – from 11 a.m. on March 11, when the march started from Thane city, to 6 a.m. on March 12 – to arrive at Azad Maidan in south Mumbai. They walked through the night to ensure that traffic due to their march would not disrupt the board examinations of SSC students in Mumbai on March 12. The Long March was the culmination of three years of farmers’ actions in Maharashtra, which started in October 2015. One of the early milestones was in December 2015, when over 50,000 peasants led by the AIKS took to the streets in 29 tehsil centres of 15 districts in all five regions of the state, demanding land rights, loan waivers, remunerative prices and drought relief. On March 29, 2016, the AIKS held a historic 100,000-strong statewide rally. There was also a sit-in at CBS Chowk in Nashik for two days and nights. Maharashtra’s chief minister Devendra Fadnavis met with Kisan Sabha leaders on March 30 that year and agreed to some of their demands, but didn’t implement them. On October 3-4, 2016, over 50,000 Adivasi peasants, women, youth and students from various districts held a 16-hour gherao at the house of the tribal development minister in Wada in Palghar district. The highways from Wada to Mumbai, Thane, Bhiwandi, Palghar, Dahanu, Talasari, Surat and Nashik were blocked as well. The minister was forced to concede (in writing) to several long-standing demands. However, after some initial progress, the state’s implementation floundered. During a historic 11-day strike from June 1 to 11, 2017, Maharashtra’s farmers refused to bring milk, vegetables and fruits for sale to the cities. On June 11, a group of five state ministers held talks with the AIKS and publicly agreed to a complete loan waiver for all farmers. A loan waiver package of Rs. 34,000 crores was announced; each farmer would get up to Rs. 1.5 lakh. However, several conditions were imposed, leaving a majority of farmers out of the waiver’s ambit. When the recent Long March ended in Mumbai on March 12, Devendra Fadnavis and other state ministers had a three hour-long discussion with Kisan Sabha leaders. On March 13, Fadnavis tabled the agreement between the AIKS and the state in the legislative assembly. The government gave concrete and time-bound written assurances to the farmers on implementing their demands. The Long March put pressure on the state government and it agreed to waive farmers’ loans for the 2001-09 period and for 2016-17 as well. It also removed a number of eligibility conditions for the loan wavier. As a follow-up to the Long March, the AIKS called for a Kisan Vijay [Victory] March in Kalwan, about 70 kilometres north of Nashik, on April 2. The local police estimated that 25,000-30,000 farmers attended this march. Then Kisan Sabha is planning to collect 100 million signatures of farmers and others across India in support of their demands. These signatures will be submitted to each district collector in the country on August 9, 2018, the 76th anniversary of the Quit India Movement. Farmers will also participate in a peaceful and democratic countrywide jail bharo (fill the jails) agitation on that day. In the preface, P. Sainath suggests that parliament should have a 20-day special session to discuss the agrarian crisis and related issues. Factoids and Focus by Subuhi Jiwani. Issued under a Creative Commons Attribution-ShareAlike 2.5 India (CC BY-SA 2.5 IN) license. Published by LeftWord Books in association with All India Kisan Sabha.